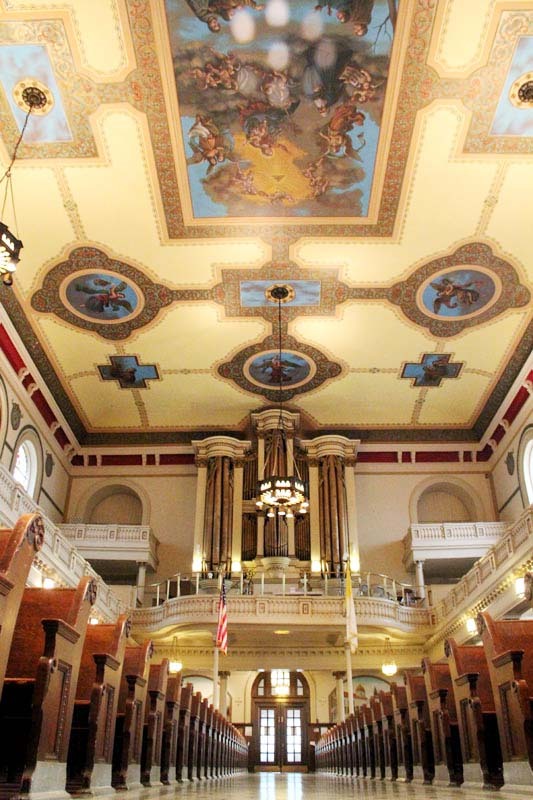 Philadelphia’s St. Augustine Church, alongside the Benjamin Franklin Bridge, has long been recognized as being truly historic. First of all, it is the mother church of the Augustinian Fathers in North America. The parish was founded in 1796 by Father Matthew Carr who arrived from Dublin the previous year. The first church, which was the fourth and largest Catholic church in Philadelphia, was not completed until 1801. In 1844, the church, along with St. Michael Church in Kensington, was burned beyond repair during the Nativist anti-Catholic, anti-Irish riots of that year. A new church, partially funded through a successful lawsuit against the city for failing to protect the church, was completed in 1848. It is this church, or more specifically frescoes within it, that through research done by local historian Celeste Morello, have just been given official recognition by the Philadelphia Historical Commission. The frescoes in question were painted by Italian artist Nicola Monachesi (1795-1851), who brought the art of painting frescoes to America. Fresco is a technique that utilizes painting directly on wet plaster, and the artist must be skillful and work quickly within seconds before the plaster dries, according to Morello. It was used by such Renaissance masters as Michelangelo, Raphael and Da Vinci. 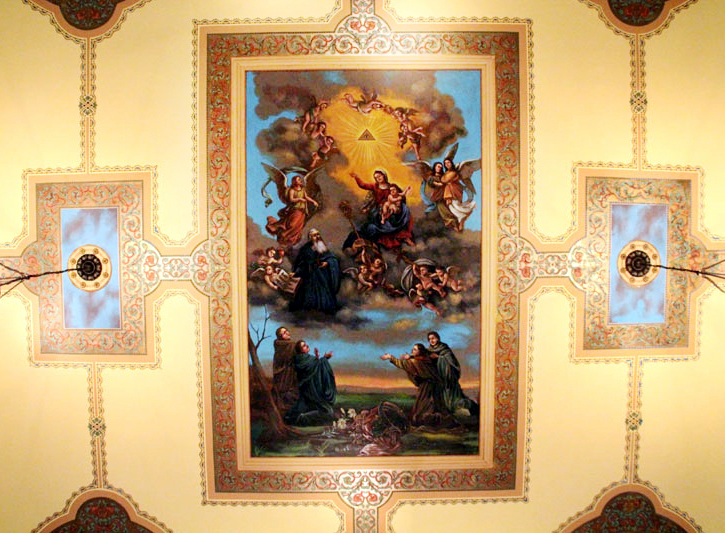 Monachesi’s 1848 work at St. Augustine predates the more famous Brumidi frescoes in the United States Capitol by about 15 years, and were the first frescoes to be painted in any American church. The significance of the Monachesi frescoes was largely overlooked in histories for St. Augustine Church until Morello researched the contemporary accounts, most notably an article in the Sept. 29, 1848 Philadelphia Public Ledger, which was reprinted in Philadelphia’s first Catholic newspaper, The Catholic Herald, on Oct. 5, 1848. While the Monachesi frescoes are the reason for this latest citation of the historic church, they are by no means alone, with other distinguished artists adding embellishments over the years, including Filippo Costaggini, who would later follow Brumidi in completing the frieze in the rotunda of the Capitol, and Luigi Scattaglia, whose works are found in many of Philadelphia’s 19th-century churches. This prophetic admonishment was plainly visible on the ruins of the first St. Augustine’s after its destruction by the 1844 mob and was incorporated into the new church. Much has changed in the 167 years since the Monachesi frescoes were unveiled, but St. Augustine Church continues still under the direction of the Augustinian Fathers. The original Irish immigrants have been succeeded by young urban professionals and a largely Filipino congregation drawn from around the Archdiocese of Philadelphia, who may join their ancestors in faith in appreciation of the artwork of the grand old church.